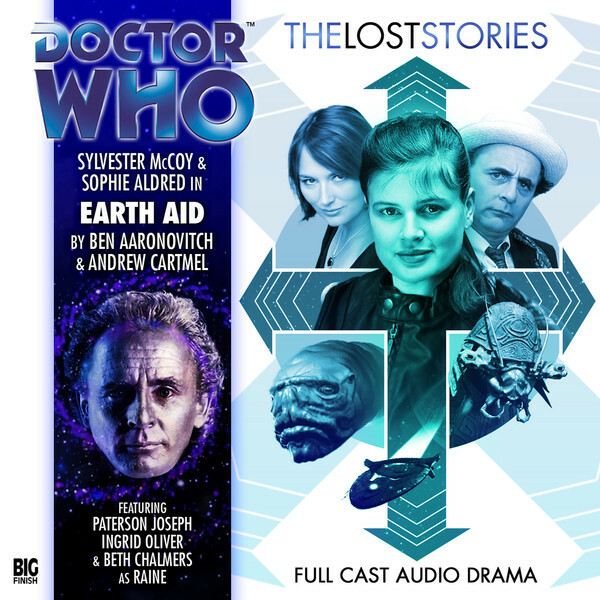 Despite previously existing only as an opening scene and a collection of ideas, ‘Earth Aid’ rounds out Big Finish’s audio recreation of the season twenty-seven that never was as Ben Aaranovitch along with Andrew Cartmel bring the space opera to life and the continuing saga of the Metatraxi to a close. Aboard the space vessel Vancouver that has been tasked with safeguarding a shipment of grain heading from Earth to Safenesthome, the tentative captain Ace and the medical officer known only as the Doctor soon find themselves under attack and in the middle of an ages-old conflict. Even if the reasoning for the setup is never explained, the notion of Ace being a starship captain and completely out of her depth while surrounded by a completely competent crew that quickly realizes something is amiss with its leader is an incredibly engaging one. Sophie Aldred gives one of her strongest performances as Ace tries to channel everything she can remember from Star Trek and other science fiction programmes to muddle her way through as best as possible with the Doctor only in a supporting role for assistance. Naturally, as the Metatraxi reassert themselves with yet another appearance in this run of stories, Ace’s prior experiences give her something meaningful to draw upon so that she can prove her strategic competence, but her previous indecision and slips of the tongue do satisfyingly come back to haunt her before she has the opportunity to ulatitely save the day. With Ace very much the focal point and the source of strong inadvertent comedy, Raine is left with surprisingly little to do despite a superb entrance that reverses the circumstances of her first meeting with the Doctor. She very much falls into the most conservative and traditional mindset of a companion, closely following the Doctor and asking the questions that need asking to have the plot advance logically. There’s no question that Raine is a fascinating character more than capable of carrying a story as snippets from the previous tales have proven, but ‘Earth Aid’ is certainly not the story to highlight her strongest attributes. Fortunately, the Doctor is given some incredible scenes, and Sylvester McCoy especially rises to the occasion as his death by taunting at the hands of the Metatraxi turns surprisingly serious and strikes at the very heart of the Doctor’s character. Whereas the first three stories of this lost season were all Earthbound affairs with more involved plots, ‘Earth Aid’ is very much a story centred around action and more dramatic set pieces. For the most part, this setup works to good effect and certainly sets this tale apart from its predecessors, but it does also result in much of the crucial information being withheld until the end, giving the resolution a rather rushed and altogether easy and convenient feeling. At the very least, once the Metatraxi are released, they are presented as the most formidable versions of themselves yet, their translator mercifully repaired to restore the menace to their holding of grudges and eagerness to join any fight presented to them. As a story in its own right, ‘Earth Aid’ is very enjoyable and makes the most of strong performances, direction, and sound design to imbue a unique and pacey story with the authentic flare of the late McCoy era. As an end to this season, though, it does little with the new companion and- much like the majority of this season- fails to truly develop the mythology of the programme and this incarnation of the Doctor, creating a somewhat lacking experience when compared to what ultimately did become the final televised season.